Facing what is certain to be a hard fought gubernatorial campaign, Governor Dannel Malloy vowed that he would not intervene (read: invest state tax money in) a pre-arranged deal between officials in Hartford and the owners of the New Britain Rock Cats to reposition the baseball team in Hartford. Chis Powell, managing Editor of the Journal Inquirer and the paper’s chief political columnist, noted wryly that any such “investment” on the part of Mr. Malloy would be redundant, since state taxpayers already provide Hartford, as well as other large non-self-sustaining cities in Connecticut, with sufficient funds that more than offset any expenses involved in relocating and housing the team. The Malloy administration certainly has sufficient experience in providing tax funds to a number of companies in Connecticut that have moved from one town in the state to another, but this time, perhaps because of the proximity of an election, Mr. Malloy has turned his face to the wall. He had already gone on record as promising no new taxes, no union giveaways and no reductions in services. Any tax money doled out to Hartford, a one-party Democratic basket case, to facilitate the Rock Cats’ move from New Britain to Hartford would, considering the campaign pledges made by Mr. Malloy, have been politically awkward. The political persona Mr. Malloy has chosen to bedeck himself with during the upcoming campaign is that of a pinch-penny accountant who loses sleep anytime a crony capitalist tax is given to multi-millionaire owners of large and small business operations. In Connecticut politics, political masks are changed as easily and often as socks, with no one being the wiser. The crowd that turned out at the Town Meeting in Hartford to oppose the Rock Cats shuffle was not concerned with the political futures of those One Party Town politicians who brokered the deal months before it was announced as a fait accompli by Hartford Mayor Pedro Segarra. Opposition to the back- room deal was vigorous – and poetic. From left field came a surprise that afternoon. We saw the latest road map to efficient fiscal doom. With details twice as blurry as a fuzzy photograph. If the goal’s creating jobs, I propose a better path. Like repairing the streets and sidewalks that are crumbling away. These are critical improvements that need capital every day. When the needs of people living here you seem to just forget? Or plowing piles of snow instead of giant mountains of debt. Will be longer term solutions to our economic lull. They are all more shovel-ready than a steaming load of bull. Mr. Brown’s poetry recital was interrupted twice by raucous applause. People in the audience were resisting the move for two reasons: 1) They felt that the priorities of the city fathers, all Democrats, were woefully misplaced. Hartford’s real needs would not be met by the relocation to the city of a baseball team; and 2) Those who arranged the deal months earlier had not consulted them concerning the move. "People talk a lot about the declining faith in government," said Joshua King, who lives on Broad Street. "This is why. This is it." "When the mayor came on, one of his biggest words was transparency," said Evelyn Richardson of Enfield Street. "How do you hold 18 months of [secret] meetings and call that transparency?" 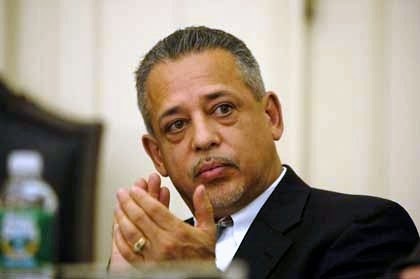 Mayor Pedro Segarra issued a response through a spokeswoman: "We have understood from the beginning that this project would require public discussion, participation and dialogue. Just like tonight, there will be many opportunities to learn more about how this revitalization will be an asset to the community for years to come." Mr. Brown touched most of these points in his poem: Public discussion should precede, not follow, major decisions. Without pre-discussion the “government of the people by the people and for the people” is thrown to the three winds. Mr. Segarra wears his arrogance well. To say in the face of such heated resistance “there will be many opportunities to learn more about how this revitalization will be an asset to the community for years to come" is to say – the only role the public may play in matters of this kind is to hear and accept supinely the decisions that have been made for you by your betters. This is the usual posture of most political leaders in one-party political operations -- countries, states, towns or, for that matter, families ruled by stiff-necked autocrats. The real problem with Hartford is that it is suffering all the ills of a one party autocracy. Always and everywhere in history, the autocrat, the patron, the Jefe, is interested chiefly in maintaining his status through the abject obedience of his subjects, who receive benefits dispensed by the one party operation without their participation or consultation. Real democracy upsets this carefully constructed autocratic apple cart. It is pleasantly startling to have fellow denizens of the Nutmegger Capital "City" (West Hartford's Ghetto) express such common-yet- good sense. Leave the Minnesota team in New Britain. Bring a second team to Hartford. Build the busway between the two stadia. We could ride back and forth to watch what would be the first-in-the-cosmos Busway Series. Future progress might include extending the Busway to a stop at East Hartford's Rentschler Field and a terminus at the Government Basketball Pavillion in Storrs. Of course, prudence would dictate that we wait for that until the State has closed its government educational achievement gap between privileged suburbanites and oppressed urbanites of colour.